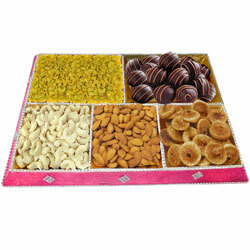 Convey your heartfelt wishes by gifting this Exceptional Gift Tray of Mixed Dry Fruits with Handmade Chocolates to the people dearest to you. This Gift Tray comes presented with Handmade Chocolates (50 gr. ), Almonds (50 gr. ), Figs (50 gr. ), Cashews (50 gr.) and Raisins (50 gr. ).